Tokidoki is teaming up with LeSportSac again for Autumn 2014. The Malaysian press got to preview the collection so there are various pics floating around on Instagram. Check them out on Elle Malaysia, here, here, here, here, here, here and here. I first fell in love with Tokidoki when they did their first collection for LeSportSac in Spring 2006. The colorful Luna bag from that collection remains the most expensive bag I ever purchased, thanks to the premium prices of LSS in Japan. 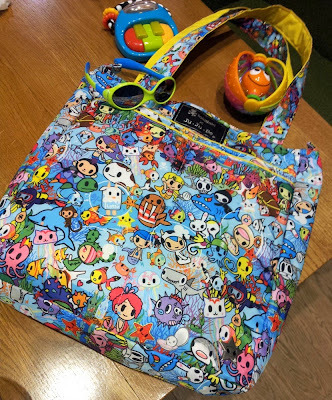 The archive of Tokidoki LeSportSac bags can be viewed here. The latest addition to my collection is the Jujube Be Light in Sea Amo, the new summer 2014 print. The bag is superbly lightweight and works great as a day bag if I'm just going out for a few hours with the baby. Tokidoki has really been hitting it out of the park with its recent releases, after the rather uneven quality of a couple years ago. Time to start saving up for the autumn, which looks like it's going to be a real wallet-bleeder on so many fronts! Awww...this is soooo cute! My daughter loves this brand for its cute designs. I will tell about this.